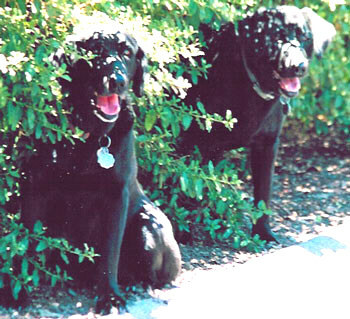 Babe (left) and Powder waiting for Dad on a hot July 2000 day. Please click on the pic for a better view. She was born near Medford, Oregon on the fourth of August 1987. Robert and Toshiko Beeman picked her up, with her litter mate sister, Black Powder of Sweetwater Valley, when she was still so small that she would fit in a shoebox. When we introduced her to her brand new kennel, she could not climb over the three inch (75 mm) high base rail without tumbling head over heels into the kennel’s runway. To all their friends, they were known just as Babe and Powder. Since both of these Labrador Retrievers were all black and looked so much alike, they had to have different color collars. 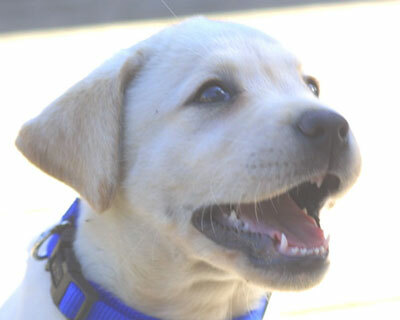 Babe’s collar was red (“Red Hot Babe”) and Powder’s was blue (“Powder Blue”). Like my human daughters, these sisters had enormous personality differences. Babe clearly was the alpha dog and took charge of everything and always insisted on being the closest to us. Neither of them had any idea that their strong teeth could be used for anything other than eating, chewing a favorite item, or trying to pull something out of their fur. Never did they bite at anyone or even snap. Babe was pure love. She never, ever, was heard to growl; not even when she and her sister were trying to get the last tasty morsel out of the same bowl of food. Oh, the two heads in the bowl pushed hard against each other, but only in competition, never in anger or with any hint of violence. Babe seemed to live just to be close to us, especially me. Because of Tosh’s allergy to dogs, she could not give her all the close attention that I did, but she loved her no less. I remember times when Babe and I sat on a ridge top of the ranch and I would lean back against Babe, who also would be sitting, and she would lean back so that we supported each other. Wherever I was, whatever I was doing, Babe would try to be there, preferably with some part of her body pushing against my foot or other part of me. Babe was amazingly smart. Not only did she easily learn good manners and the job of being a retriever, she learned many things from just a single incident. 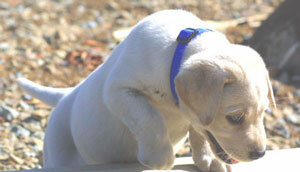 When she was still quite young, I was throwing a stick for them to retrieve. While Babe was off getting the stick, I played a bit of trick on her by hiding the nylon chew bone that she had left to run after the stick. When she returned to me, she was clearly shocked to see that her chew bone was gone. Of course, I gave it back to her a few moments later, but the next time, when I offered to throw a stick, she ran around the back of the teahouse knoll and hid her chew bone before she was ready to go after the stick! Sometimes, over the past few years, she would shiver and shake. We, and the vet, thought it was just that she got cold easily. We got her a nice red insulated foam coat and she seemed to enjoy having it slipped on - though that probably was just that she enjoyed the attention and it was something that we seemed to want her to wear - and she always tried to please us, as best she could or could understand. Unfortunately, the shivering may have been the early pains of mesothelioma, a cancer of the heart, lung, and body cavity linings. About a month ago, she suddenly began to swell and become very slow. An ultrasound scan, x-rays, and finally a biopsy, indicated that she had this presently incurable cancer. For those weeks, we tried to help relieve her symptoms, but she steadily got worse and began to show signs of continual pain and she almost entirely stopped eating. No matter how sick or weak she was, she still would look up into our eyes and wag her tail - at least a little bit. Finally today, the twenty second of September 2000, I realized that I was keeping her alive because I could not bear to think of parting with her. If I was truly her friend, I could not let her suffer more; she clearly had no more joy of life, there was just misery, mixed with what very little comfort we could give. So, today, we decided to gently put her to eternal sleep. Babe, we will miss you so very much. And we are so sorry if you suffered in ways in which we could have helped you - if we had only known. But, you never would complain. It is so good that we did get to share so much fun and so much love. After Babe passed away, we and Powder realized that we really didn't know each other very well. It was clear that Powder had bonded to Babe instead of us. She had lived in Babe's shadow and she was lost without her. In the months that followed, we slowly began to pick up the task of relating directly. She had developed a hip problem that made it very hard for her to walk, but she began to beg to be taken places. Her greatest joy seemed to be zipping along in the open air in the back of the Gator, our six wheel ranch buggy. She was a bit of a silly dog, but she also had a heart of gold. Finally, on the warm Saturday afternoon of June 30, 2001, some internal disorder became critical and this aged old trooper quietly slipped away into that sleep of sleeps. She joined her sister on a lovely eastern slope by our home, eternally overlooking the beautiful Sonoma wine country. She was a good dog. After a proper period, we found a new puppy to occupy Babe's house. 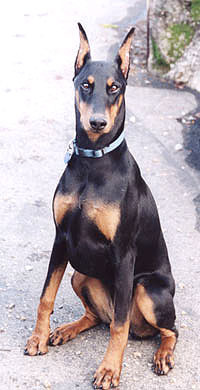 Here, on October 7, 2001, are some "proud parent" pictures of our new baby: "Bos" (fem. 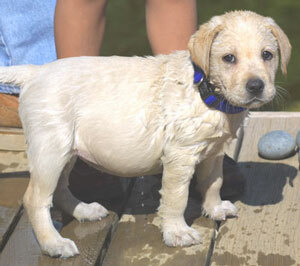 form of Boswell, the company bearcub mascot), a little female Labrador Retriever puppy at 7 weeks. 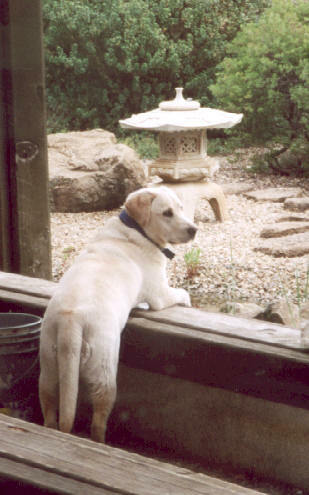 Four pictures: A portrait of innocence, climbing way up onto the deck, falling off deck into koi pond for first swim, then so wet! Side note: Bos looks pretty unhappy after having fallen in and gone all the way under the water on her first day at her new home. 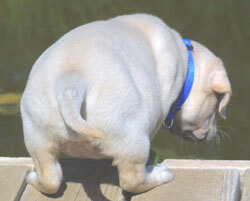 As a result of this traumatic experience, she, a Lab who is supposed to love water, was terrified of water. Dad had to put on tough work clothes (to protect against scratching from a frantic dog) and take her in the swimming pool for fully supported wettings and finally supported swims until she got over this fear. Now Bos swims like a fish and takes herself for swims in ranch ponds whenever she gets near to them! 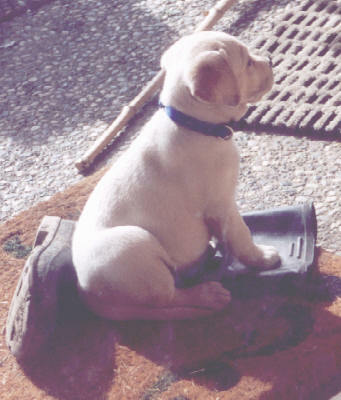 Bos at four months of age: "Dad's boot is my security blanket!" Bos contemplates her world at 6 months. Not all of our "Dogs" are dogs!! Actually, not all of the canines on our ranch are dogs! 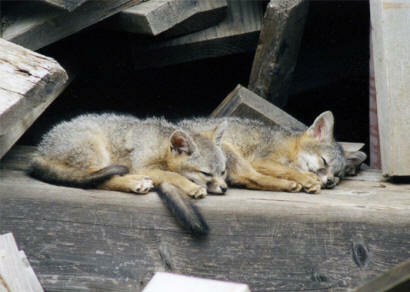 The woodpile visible out of one kitchen door was a good place for a wild gray fox to litter. Here are two of the cute pups sunning themselves while mom is out hunting up dinner! And we have two groups of wild Western Coyotes, neither of which I have been able to nail with a camera. One group is only a mother and a quite silly adolescent pup who run along the old stagecoach road visible from my tower office. The other is group, never seen, of perhaps a half dozen adults, who run at night every so often, while howling to the moon, in the trees just south of our house. Around here it is the dogs that have to fear the cats. Mrs. Beeman was startled to see something streak across our incoming road - she said that it was yellowish and that the nose was even with the left side of the road as the tail just was even with the right hand side - that's just about 10 feet total - just about the nose to tail tip length of a mountain lion. (aka Cougar, Puma, Crescent Tiger, Ghost Cat). We found a dead deer spread out over about a 50 yard circle about a month later - evidently two "cats" had been discussing ownership of the carcass.